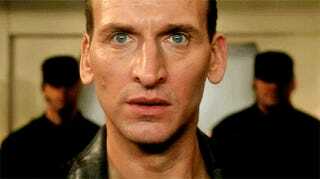 Question for Doctor Who Fans: HOW DO THEY GET AROUND TIME TRAVEL! Hallo there! I just started watching Doctor Who (the reboot) since it hit Canadian Netflix. I am watching it 100% because of you crazy GT Whovians, so I thought I should pose my question to you. CAUSE THIS IS ALL YOUR FAULT. Do they actually get around the time paradox as far as plot development goes? Item 1: The episode with Rose's father dying proves that they can go back to the same time when they are already there. Item 2: Later Doctor Who reboot #1 says something vague about 'we can't cross our time path' or something. David Tennant, in the episode I just watched (Madame de Pompadour FTW!! ), says they can't use the Tardis because they are now part of events. So like the earlier mention, they can't cross their own 'path' in time. HALP! Does this end up making sense later? Is it just kind of a plot device that isn't fully explained? I looove sci-fi, and will love this show even if it doesn't have a good explanation, but I feel a particular joy when science fiction writers think up good time travel rules and stick to them. Internal logic and whatnot. I am halfway through season 2, so if your answer is "YES they fix this in season 5!" that's totally cool - try not to spoil if possible, but this show is about a lot more than the big plot details, so I'm not overly worried. ETA: Does anyone know how to embed gifs in the new editor? I could only find URL link, font, and quote... had to switch to the old one. Hmmm.